It will be the legendary Los Angelino trombonist Glenn Ferris , one of the greatest figures in the contemporary jazz scene, already a precious collaborator of Frank Zappa, Stevie Wonder, James Taylor and Duran Duran , to inaugurate the 14th edition of the Jazz Group , Tuesday , May 15 at 21.30 at the Circolo Arci Il Girone (via Aretina 24). The musician will perform with the Italian Quintet, composed by Mirko Mariottini on clarinet, Giulio Stracciati on electric guitar, Franco Fabbrini on double bass and electric bass and Paolo Corsi on drums, in a free concert, which anticipates the release of the album Animal Love of this summer . The Girone Jazz review, curated by Nuovi Eventi Musicali , Il Girone and Eventi Music Pool , will propose, until May 29 , three events to explore all the nuances of jazz, in the company of the stars of the Italian and foreign jazz scene. The main theme of this year's edition is dignity : "We want to pay tribute to all the people who with their commitment and their testimony represent the daily value of dignity and freedom. We dedicate these three concerts to them thanks to the commitment of the club, its workers and volunteers. To do so, and to spread our message as much as possible, the concert with Glenn Ferris will be free admission : a gift for everyone ", says Augusto Benvenuti , artistic director. The Glenn Ferris Italian Quintet will propose a concert full of energy, creativity and unpredictability. A mix that will try to immediately capture the listener to lead him into an engaging dimension, where the five musicians will move with great technical skill, interplay and expressiveness. The group, formed in 2015 during the Volterra Jazz Festival, after establishing a strong human and musical feeling, decided to repeat the experience by giving life to a mini-tour with a repertoire based essentially on original pieces. 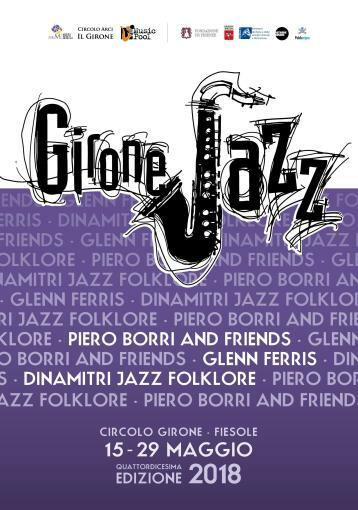 The quintet will perform in Florence for the first time, performing original songs by Glenn Ferris, from "Animal love" which gives name to the next cd , to "Calabria night", "Istanblues", "When the night tourn into day" and " The purpose ". In addition to the tracks contained in the album, the traditional "St. James Infirmary ", made known to the public by Louis Armstrong and the song" Five in China "by Mirko Mariottini , a play on words that refers to the quintet , built on fourth and fifth chords as happens in Chinese music. The round Jazz continue m Artedi May 22 with Piero Borri & Friends, a special evening that will combine in the same concert five musicians, landmark of Italian jazz, namely the drummer Piero Borri, Stefano Cocco Cantini on sax, Nico Gori on clarinet, Kalman Olàh on the piano and Ares Tavolazzi on the double bass (entry 12 euros, 10 the reduced). The festival will close on May 29 with the Dinamitri Jazz Folklore , one of the most interesting formations in the field of creative music that sees Emanuele Parrini on violin, Beppe Scardino on baritone sax, Gabrio Baldacci on guitar, Paolo Pee Wee Durante on hammond, Andrea Melani on drums and Simone Padovani on percussion . Under the guidance of the saxophonist Dimitri Grechi Espinoza , the band will explore the jazz language investigating the connections between the various musical traditions: from bebop to the polyphonies of New Orleans, to blues to Africa, in a continuous search for innovation and traditions of cultures only apparently distant. Prices : single entry € 12 full, € 10 reduced for Arci members, young people up to 25 years for the dates of 22 and 29 May. Free admission on May 15th.